Kit Two Includes 217 Pieces. 6 - 2 x 2 Gauze Pads. 8 - 3 x 3 Gauze Pads. 8 - 4 x 4 Gauze Pads. 4 - Bloodstoppers. 1 - Sting Relief. 1 - CPR Mouthpiece. 6 - Tongue Depressors. 18 - 1 x 3 Band-Aids. 1 - Tweezers. 1 - Whistle. 1 - Stethoscope. 1 - Thermometer. 2 - 2 Ace bandages. 6 - Pain Stoppers. 6 - Non Aspirin. 6 - Buffered Aspirin. 4 - Ice Packs. 6 - Pair Nitrile Gloves. 2 - Solar Blankets. 6 - Sterile Eye Pads. 3 - Sun Block. 3 - 4 x 7 Combines. 12 - 3 x 1 1/2 Knuckle Bandages. 6 - Fingertip Bandages. 4 - 3 x 4 Non Adhesive Bandages. 1 - Ammonia Inhalant (10 Pack). 6 - 2 x 3 Patch Bandages. 12 - Sanidex Antimicrobial Wipes. 12 - Alcohol Preps. 12 - Antiseptic Towelettes. 2 - Wire Splints. 9 - Antibiotic Ointment. 6 - Iodine Prep Pads. 6 - Sterile Gauze Rolls (2 x 6 yds.). 3 - Adhesive Tape (1 x 10 yds.). 4 - Triangular Bandages. 6 - Large Butterfly Bandages. 6 - Towelettes. 1 - Carrying Case. 1 - Paramedic Scissors. 6 - 4 x 4 Cool Blaze Burn Gel. 8 - 1/8 oz. Cool Blaze Burn Gel. 1 - Life Savers. 2 - Chapstick. 1 - 27 Page First Aid Book. 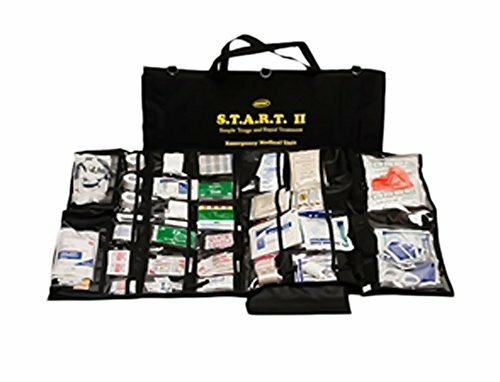 Kit Includes: 6 - 2 x 2 Gauze Pads. 8 - 3 x 3 Gauze Pads. 8 - 4 x 4 Gauze Pads. 4 - Bloodstoppers. 1 - Sting Relief. 1 - CPR Mouthpiece. 6 - Tongue Depressors. 18 - 1 x 3 Band-Aids. 1 - Tweezers. 1 - Whistle. 1 - Stethoscope. 1 - Thermometer. 2 - 2 Ace bandages. 6 - Pain Stoppers. 6 - Non Aspirin. 6 - Buffered Aspirin. 4 - Ice Packs. 6 - Pair Nitrile Gloves. Kit Includes: 2 - Solar Blankets. 6 - Sterile Eye Pads. 3 - Sun Block. 3 - 4 x 7 Combines. 12 - 3 x 1 1/2 Knuckle Bandages. 6 - Fingertip Bandages. 4 - 3 x 4 Non Adhesive Bandages. 1 - Ammonia Inhalant (10 Pack). 6 - 2 x 3 Patch Bandages. 12 - Sanidex Antimicrobial Wipes. 12 - Alcohol Preps. 12 - Antiseptic Towelettes. 2 - Wire Splints. 9 - Antibiotic Ointment. Kit Includes: 6 - Iodine Prep Pads. 6 - Sterile Gauze Rolls (2 x 6 yds.). 3 - Adhesive Tape (1 x 10 yds.). 4 - Triangular Bandages. 6 - Large Butterfly Bandages. 6 - Towelettes. 1 - Carrying Case. 1 - Paramedic Scissors. 6 - 4 x 4 Cool Blaze Burn Gel. 8 - 1/8 oz. Cool Blaze Burn Gel. 1 - Life Savers. 2 - Chapstick. 1 - 27 Page First Aid Book.